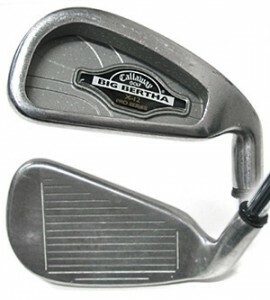 Released in 1998, the Callaway X-12 Irons are part of the Big Bertha technology basis from which many Callaway designs have sprung. The X-12 has a thinner profile and topline (generally favored by better players) than many other Callaway iron designs, which gives these a more compact and cleaner look. The Big Bertha design really starts with a low center of gravity (CG) which helps get the ball airborne more quickly and easily. These irons also feature a significantly offset hosel and cavity-back head with perimeter weighting -- all designed to improve performance (both distance and direction) on off-center hits. The shaft is a "bore-through" design where the end of the shaft is visible on the heel of the club. For me, this is really a cosmetic design element, but some claim it reduces twisting of the clubhead at impact, which of course would also help consistency. Having used other clubs with a bore-through shaft, I have not found this to have any impact one way or the other. While these clubs have been played by nearly every level of player, they are targeted at the intermediate handicapper. These days, of course, you're looking at a used set of X-12s -- and due to the prolific distribution and popularity of these clubs in the late '90s, they are widely available on the used club market. Built in both Right and Left hand orientations, they were shafted with either steel or the RCH99 graphite from Callaway. A variety of flex options from Senior to X-Stiff in both versions were made, so finding a set, or even an individual club, in the type you need is within reach. Also, these were made at a time before hybrids were common, so you'll likely see everything from a 1-iron to an L-wedge. Cosmetically, these are pretty simple. The investment cast process used to make these doesn't lend itself to a lot of beauty. They have a flat stainless steel finish, and the only embellishment is the characteristic Callaway logo insert in the cavity back in their standard royal/white/black.